We are linking up with Head Over Heels for Teaching Spark Student Motivation to share our class's Super Improvers Wall. We started this a few weeks back and the students are LOVING it!! It's a part of whole brain teaching and a great way to motivate students with academics and behavior using positive reinforcement. We found this wonderful Super Improver Wall Resource from KPM doodles. 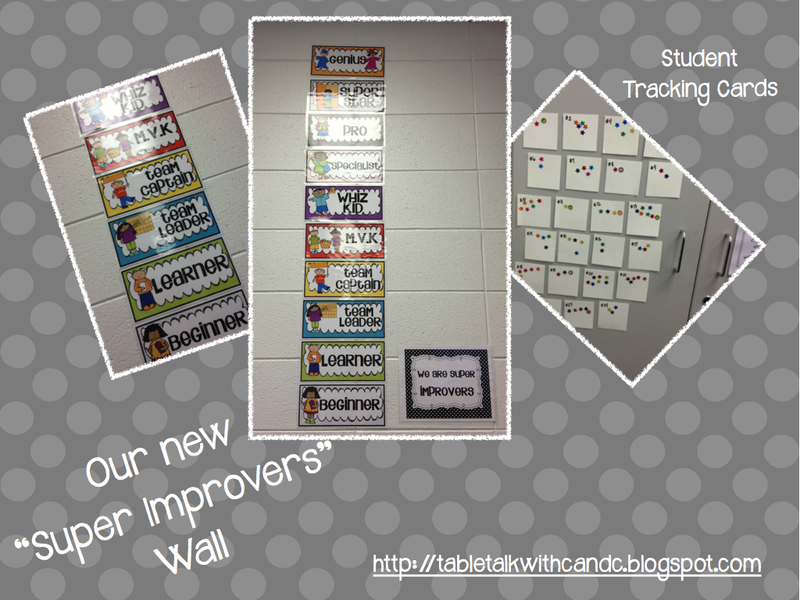 click here to download her free Super Improvers Wall labels! To learn more about how to implement a Super Improvers Wall in your classroom, visit the Whole Brain Teaching website. Whole Brain Teaching has some incredible classroom management techniques to keep students motivated and engaged! There are tons of resources out there to help you implement it in your classroom! I imagine many of you are trying to find way to keep your students motivated for this last stretch of the year, like we are! We decided to incorporate the Student Improver Wall to help reinforce that we are so proud of hard work and effort on anything they improve on. The purpose of the Super Improver Wall is to be on the look out for students who are going above and beyond what they would typically do to improve on something. It could be something related to academics or behavior. For instance, our students have earned a sticker on their student card by demonstrating how to sit quietly and raise their hand during whole group lessons, staying focused on an assignment, participating, problem solving independently, improving on how many sight words they can write correctly, improving their fluency, working independently, lining up and walking in the halls. keeping their desk clean, helping others...the ideas are endless!! Each time a student(s) earns a sticker, the class celebrates the improver by doing a whole class cheer! Some of our class cheers are "fireworks, cowboy, cheese grater!" Once they earn ten stickers, they move up to the next level on the Super Improver continuum. The color of their new card will match the color of the level. When students accomplish a level, we take a picture of the student in front of the Super Improver Wall with his or her sticker card and celebrate the accomplishment with the class. It's been a very positive experience so far!! The kids are just eating up this new behavior management system. Even our most struggling learners who have a hard time making good choices have been working very hard to improve on their behavior! Who would have thought that a simple technique such as changing the color of a card would be just the right ticket to help our students think more intrinsically about their choices and learning! What are some things that you do to "spark" your students motivation? And be sure to check out other ideas at Head Over Heals for Teaching! 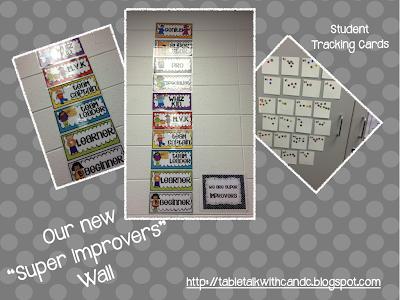 Love the super improver wall-great visual-and they get to keep going...super motivational! Thanks for sharing and coming to my party! Thanks Joanne! It's been a great motivator for our students. Thanks for hosting a fantastic linky party!